bp received a $5,000 grant from the Canada Council to produce this outdoor music-theatre work. 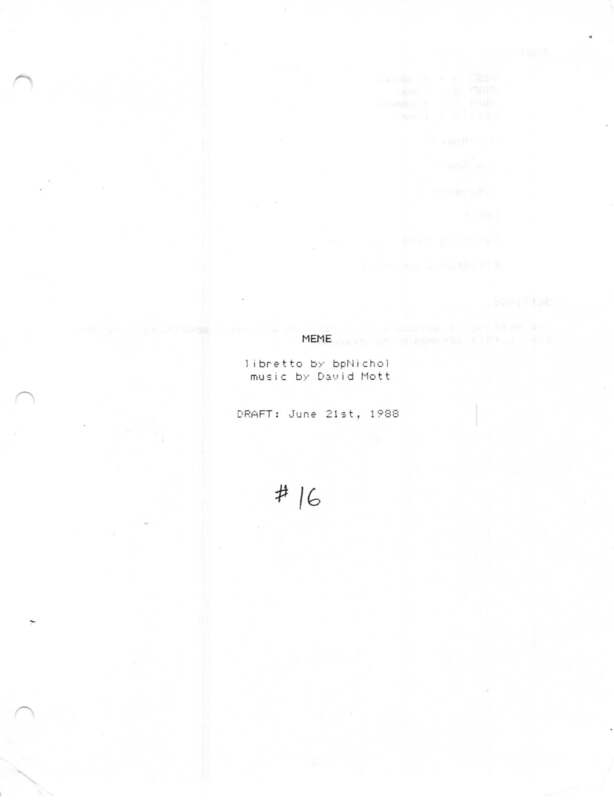 A portion of this work was published as "A Text for the Dreamer, from MEME: a nopera" in Descant 63 (1988): 53-7. Paul Dutton writes: "Meme, in three acts, is subtitled "A Nopera" and calls for two male and two female poets (sound poets, actually), two solo singers, three dancers, a choir, a marching band and an electronic ensemble. The language the poets speak is one of Nichol's own invention, comprising a limited vocabulary of eleven root words, with various prefixes and suffixes of a mainly prepositional nature. The words, which signify a few objects and elements in nature, some personal pronouns, and a few basic emotional states, serve the purposes of the simple drama that gradually unfolds. The choir, which functions as a Greek chorus, mixes English with the language Nichol invented. The script for Meme contains a text that is read repeatedly by a character called The Dreamer, and Mott informs me that he and Nichol here consciously followed the lead of Luciano Berio, who used a similar device in hisSymphonia, a work they were both familiar with. A singular feature of Meme, in relation to Nichol's other musical-dramatic collaborations, is his optophonetic scoring for some of the sound poetry. For the rest of this work, and in those others where sound poetry is scripted, Nichol primarily did just that: scripted. This meant, perforce, that he established some rhythmic aspects and chant-indicative repetitions, but for the most part the character of the sound was left to the composer to determine."